Homemade Low Carb Vanilla Cupcakes with Vanilla Whipped Frosting is the perfect go to recipe for when you need something sweet while on a low carb eating plan! 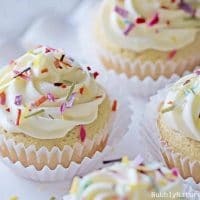 Low Carb Vanilla Cupcakes are also perfect for a party or celebration treat without having to go off the diet! It’s probably no surprise to anyone that I crave cupcakes on a weekly and sometimes bi-weekly basis. I am not one of these people that can eat just the icing or just the cake. I have to have the whole thing together which is like one bite of cupcake bliss! My favorite cupcakes have always been vanilla with vanilla icing. Maybe it’s because they are always served at special occasions like birthdays (with fun sprinkles), but I will always go for the vanilla first. Since I am now following the Trim Healthy Mama way of eating I needed a cupcake recipe that would satisfy my cupcake cravings without sugar or tons of carbs. These cupcakes hit the spot perfectly! I notice when eating these Low Carb Vanilla Cupcakes that one fills me up and I really don’t want two or three! 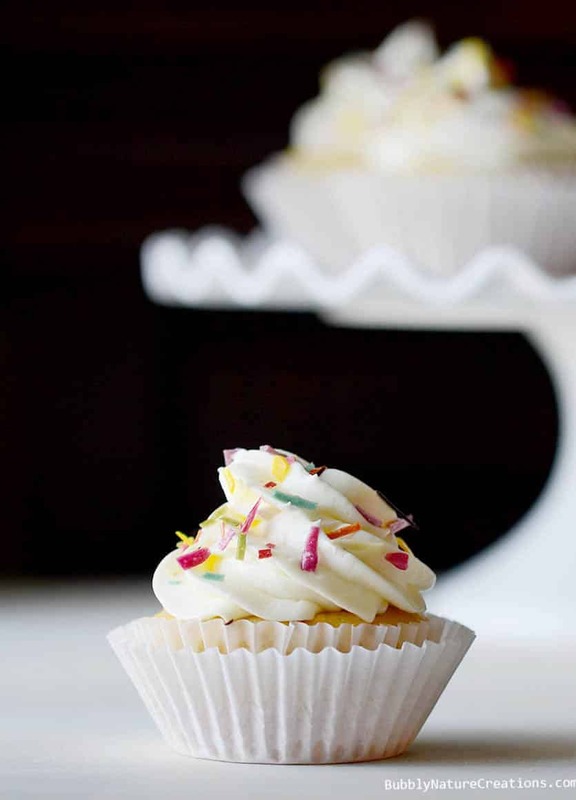 Be sure to top them with Whipped Vanilla Frosting which is absolutely divine even on it’s own. I hope you enjoy them and also check out my homemade sprinkles below too! See that the navy beans have around half the amount of carbs that other beans have. So this is why the white navy (also called great northern) beans in this is crucial. The total is 134 carbs and there is 56 grams of fiber. Net carbs come to around 6.5 per cupcakes which is in the allowable limit for the Trim Healthy Mama plan and many other low carb plans out there. Also, I do not count the carbs from the sweeteners because with Trim Healthy Mama they do not count. Please keep this in mind because you may want to do your own calculations if you need to. 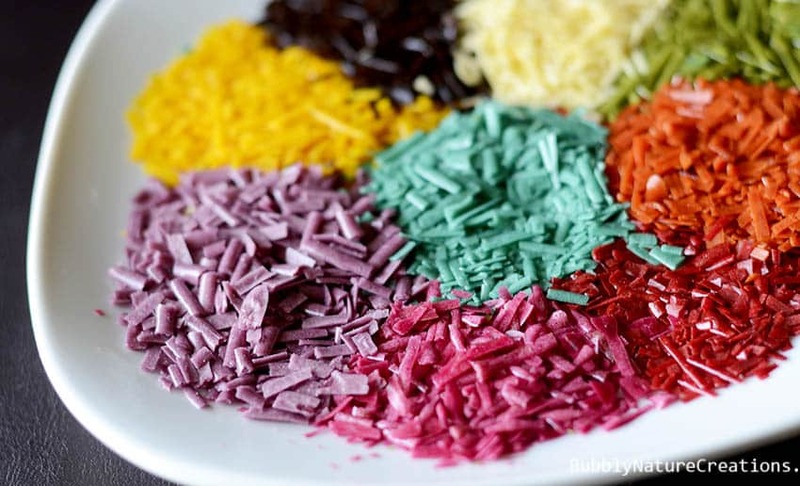 Try these Homemade Sprinkles that are sugar free, all natural and perfect for Trim Healthy Mama desserts! I love the way they look on these cupcakes and add such a fun touch. I know I’ll be serving up these Low Carb Vanilla Cupcakes w/ Vanilla Whipped Frosting to any of my fellow low carb or THM friends. For the Sprinkles see this recipe! Preheat oven to 350 degrees. Beat eggs, bean puree, stevia, heavy cream, vanilla and Erythritol in a large bowl. Combine the whey protein, coconut flour, baking soda and baking powder in another bowl. Mix in coconut oil into the whey protein mixture with electric mixer until combined. Slowly pour in the egg mixture into the whey protein mixture while beating. Batter will be a little lumpy. Line a muffin tin with cupcake liners. 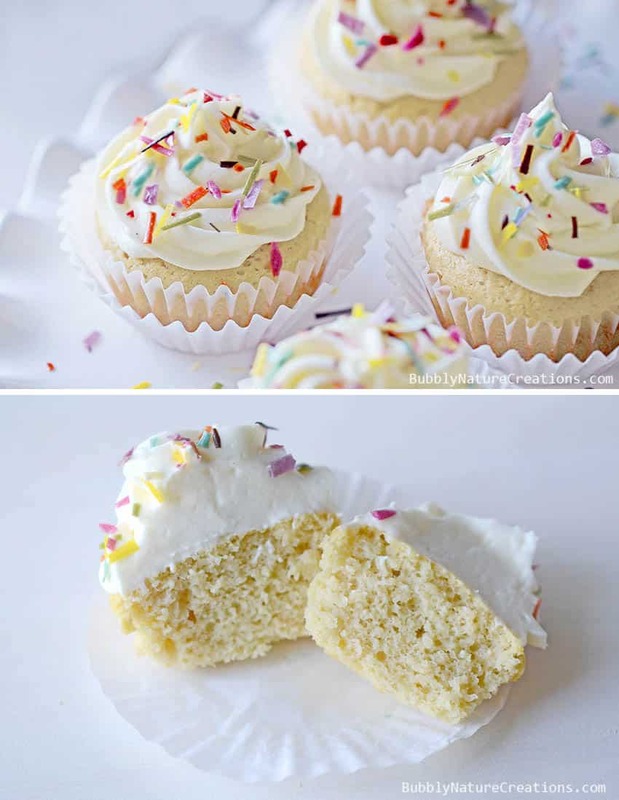 Use a 1/4 cup of the batter to fill each cupcake liner. Batter will make 12 cupcakes. Bake for around 25 minutes making sure not to over bake. Edges will be lightly browned and the middle should lightly spring back when done. Take out and for the best taste results cover them and refrigerate for 2 hours. You can also eat them right away, but this will make them taste even more moist and wonderful! Once you take them out of refrigerator top them with the Whipped Vanilla Frosting and sprinkles! For the frosting... Grab a medium sized bowl and Whip egg whites, stevia, vanilla and powdered xylitol with a mixer until it has doubled in volume. In another medium sized bowl add the butter and stevia and whip for 1 minute. Slowly add the egg white mixture to the butter mixture and beat until smooth and fluffy. Sprinkle in the Xantham gum and heavy cream then beat on high for a few minutes until the mixture starts to thicken up and become smooth. If it is too "gummy" then add more heavy cream until you get the right consistency. If it is not thick enough then add 1/8 tsp more Xantham gum at a time until you get the right consistency. There are around 6.5 Net Carbs per cupcake! 12 cupcakes per batch! It's important to do your calculation with NAVY BEANS. These are white beans and different from pinto or other beans and will throw off your final calculations of NET CARBS. I subtract the fiber from the total carbs because my eating plan (Trim Healthy Mama) allows for this. So keep this in mind if you are on a stricter plan. Hope this helps. Awesome! Where are you finding your “special” ingredients? Are you ordering or are there shops there where you can find this stuff? First, your pictures are BEAUTIFUL! I am so intrigued by white beans in your cupcakes! Oh my goodness, those look super delicious, pinning for sure! These cupcakes look great! Thanks for sharing! 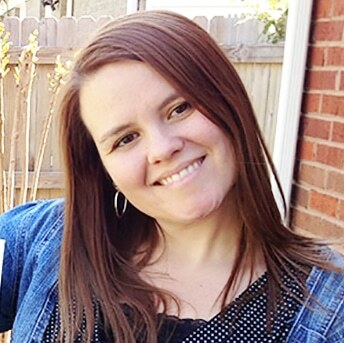 I’m just learning the THM plan–and RE-learning how to bake. Since I only cook for my husband and me, hopefully we won’t eat all these cupcakes at one sitting and they’ll be around for a few days. I was wondering about this whipped frosting. Since it has the whipped eggs and whipping cream, does it hold up over time? Does it need to be refrigerated? I just found your recipe and am it will be a great fit for my THM baking day. I love the flavor of the cupcake & the frosting. I wonder if there is a tweak to your recipe posted here for the frosting? Mixing the stevia in the butter? Also, mine was really gummy even after whipping the heavy cream separately to correct the issue. It tastes great, it just looks like cottage cheese. And I managed to get 14 cupcakes out of the batter and it bubbled over in my oven! But they are sooooo tasty. If you are making this with the THM sweetener, thoughts on how to substitute it in the cupcakes and the frosting? This cake was perfect! Thanks for posting it. There are around 6.5 Net Carbs per cupcake! 12 cupcakes per batch! It’s important to do your calculation with NAVY BEANS. These are white beans and different from pinto or other beans and will throw off your final calculations of NET CARBS. I subtract the fiber from the total carbs because my eating plan (Trim Healthy Mama) allows for this. So keep this in mind if you are on a stricter plan. Hope this helps. How much is half a scoop of whey protein? I know scoops very in size and want to have the correct measuring amount, making this for my son’s birthday! :) ty! Hi Margo! The one I use is around 1/4 cup (edited). It is pure whey with no added ingredients. If yours is sweetened then reduce the amount of sweetener you put in.